Garin Nugroho is perhaps the most dominant figure of Indonesian filmmaking today. That is a big statement, but perhaps not one that is undeserved. Having said that, given that I am not all that familiar with the films from across the Malaccan Straits, it certainly seems that perhaps it would be wiser to hold my tongue. But here is the truth, one that even I know is inviolate: when one thinks of Indonesian films, the director’s face is one that pops to mind the most often. It is not just the fact that his films are well-known, or that he is somewhat prolific in his filmmaking endeavours. It is also the subject matter of his own films. Aspects of Indonesian culture is almost always present in his films, so much so that at times, it feels that he is not merely a filmmaker, but also someone who can be accurately described as a historian. The Indonesian 'Twilight' had local culture in it. 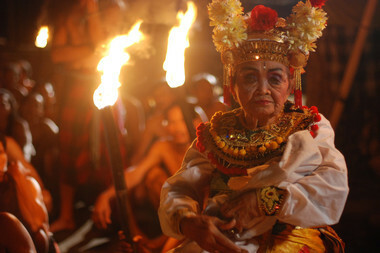 It is, therefore, no surprise to see that Balinese culture is once again in the background of the film’s narrative, providing a context to the proceedings in front of it. We follow three different women who live three rather different lives. Maharani (Marcella Zalianty) is a young woman hailing from the big city of Jakarta. She has returned to her roots in Bali to look for her mother, but finds herself becoming more and more attracted to the dance put on by the Balinese almost every night it seems. Unfortunately, she also finds herself caught in a web of baby trafficking. One person trying to escape from a web is Nian (Nadia Saphira). She is also from Jakarta, but the web she is trying to escape from is the trapping of fame. In trying to escape the trappings of fame, she finds comfort somehow in the arms of a stranger Darma (Ikranegara). Since her own father was jailed for corruption, Darma fills the father figure vacuum. Unfortunately for all concerned, he is due to go through a death ritual that puts his life at great risk. Finally, we have DJ Dewi (Ayu Laksmi) who is…surprise surprise, a radio DJ. On a personal note, I’ve always found that life of a radio DJ (and that of a TV presented, for that matter) to be rather interesting; bound as they were by the personalities that they’ve created, they have to be ‘on’ with the character practically 24/7, or at the very least for the duration of their respective shows. Thus is the story with DJ Dewi. Her world comes tumbling down when, having a regular check up on her unborn child, it was revealed that the child born will be disabled, and will actually die soon after birth. Not the good news any parent, I imagine, would ever want to hear, and a massive dilemma for her: should she abort, or should she continue, perhaps in search of a medical miracle? Her initial reaction was to hit her stomach, in frustration, in anger, in sadness and bitterness. Ironic, given that someone else somewhere were involved in the trading of babies. 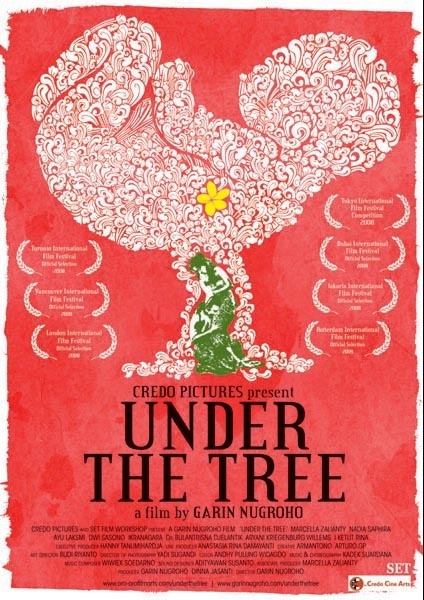 It is a somewhat crude reaction, one that stands out, but then again, ‘Under the Tree’ is a film that stands out for several different reasons. In stark contrast to ‘Opera Jawa’, I feel as if this film has been immersed in some sort of water that drained a lot of the colours away. There is a noticeable lack of saturation (amount of greyness) in them. ‘Opera’ was very colourful, but ‘Tree’ feels somewhat subdued in comparison. The subject matter may well be the influencing decision, however; the characters don’t exactly have a plotline comparable to ‘Happy Days’, and so I suspect that the decision was made with that in mind. “Sunrise in Bali is short, but so beautiful,” said the director in an interview. The beauty comes because it is short; it would be meaningless otherwise. The local Shakespeare production was extravagant. In a much earlier post on Garin Nugroho, my friend Maszalida Hamzah wrote of him as a photo-poet: “His graphical assessment of the environment is singularly treated as the nation is seen not in separation but in one with his motherland, Indonesia. His creation is a living energy that he empathises into a world of his own, like as if he is the one undergoing the dilemmas of his characters…it is the freedom to create and to unleash the very act of becoming that he himself aspires to be.” Thus, while such poetics are kept at bay in contrast to the rest of his filmography, you can’t really escape from them completely. For example, there is an excellent “I want a man who can turn my heart into a flower.” In Indonesian, however, it is even more beautiful: “Aku ingin laki-laki yang meniup jantungku menjadi bunga.” Though the Malay language and the Indonesian language are practically the same, I don’t know why Indonesians (in the arts, at least) seems more at ease to use it more poetically. Beyond the poetics, the things surrounding the characters also become a character of sorts. Perhaps I could be forgiven to call them non-actor characters? It could be the beautiful Balinese backdrop (which was only briefly shown in all its glory, mind you), but also the traditional dances and events that goes on. Having found Darma, Nian finds that she must decide between letting the death ritual go ahead and and physically grabbing him with her might and not let go. With Dewi, it is the powers that be who put her in her predicament, without much help from others in that respect either. Going back to the people, Maharani also finds herself in trouble because of what others do to her. This film makes plight of women in different circumstances, but all facing difficult decisions to make. It reminds me a little bit of ‘Chants of Lotus’, and less of the Garin works that I have seen. Nevertheless, while they tackle similar subjects in different ways, I see enough from this film to conclude that Garin’s work, at least as a historian, is not quite done yet. Fikri finds this a relief to write about following ‘Antichrist’.